November is family history month. I am taking FAMILY HISTORY MAGAZINE’S challenge to write from a daily writing prompt. I plan to post them here on my blog but don’t expect me to get them done in a month. Prompt one – Choose an ancestor you never knew that you wish you could talk with to learn more of their life history. After mulling it over I decided to write to the ancestor I was named after for, Margaret Ragsdale Caple, my great-grandmother. You and I share the same first name. My father, your grandson spoke fondly of you. Both he and his sister told me about the fun they had sleeping in your big feather bed. My Aunt Iva loved the tea parties you had together. She gave me your teapot, it sits on a shelf where I see it daily. I wish we could sit and talk while sipping some of your delicious sarsaparilla tea. There is so much I’d like to ask. For instance, how did you meet my great-grandfather Samuel Hugh Caple when he lived Jasper County, Iowa and you in Green County, Missouri? Was the age difference between you ever a problem? What was it like traveling the Oregon Trail? What was it like living in a sod house? Which of your three mothers made the big star quilt I now own? Which brings me to the question I most want answered. Who were your birth parents? I’m sure you knew. Your children said your parents died when you were an infant during a measle or small pox epidemic and you were adopted by cousins. Through my research, I know you were born in 1858. Two years later in the 1860 census you were living in the home of Richard Jordan Ragsdale, age 52 and his first wife Jincy, age 49. You are listed after their children, a niece and her infant and Richard’s brother William Ragsdale. Your name, Margaret, is easy to read but the word after it, beginning with M, is not. It could be your last name, perhaps Munda or it could be Melinda, which was your middle name. Some researchers think you might have been the granddaughter of Richard Jordan’s sister Lavina who married Edwin Adams. When they died, leaving three young daughters, Sally Merritt Ragsdale their grandmother cared for them and after her death, Richard Jordan and Jincy took over. If you belonged to one of them, it would have been natural for them to raise you. I can find no information on what happened to two of the girls so it could be true but you would have been Richard Jordan’s great-niece not cousin. You could also have been a cousin of Jincy and I guess the Adams girls were her cousins for she and Richard shared the same ancestry. Jincy’s grandfather was Richard’s great grandfather and their mothers were sisters. Was all that as confusing for you as it is for me? Or maybe you never knew about it because in 1863, when you were five, Jincy and her daughter died of smallpox. It was during the Civil War and the family had moved to Rolla, Missouri for safety. I wonder if this is where the story of your losing your parents in a smallpox epidemic comes from, I guess I’ll never know. Richard remarried a widow in 1865 giving you a third mother and she and Richard went on to have nine more children. By the time the 1870 census was taken, you were listed as one of the Ragsdale’s with no distinction made between you and the other children. It’s clear in a letter Richard Jordan wrote you in 1888 (now in my possession) that he thought of you as a daughter. And you named your youngest son after him. Recently I had my DNA tested, something you never heard of. Perhaps one day it will help unravel the mystery of your parents. In the meantime, I will have to content myself with knowing my DNA suggests a link, to the Ragsdale tree, the same tree, Richard Jordan and Jincy belong on. Which ancestor would you like to talk to? Why? Please, feel free to let me know in the comment section below. This entry was posted in Uncategorized and tagged ancestry, Edwin and Lavina Ragsdale Adams, family history, Family history challenge prompt 1, Jincy Ragsdale, Margaret Ragsdale Caple, Missouri, Richard Jordan Ragsdale, Sally Merrit Ragsdale on November 5, 2016 by kwriter13. John Meyer and others at is home in Cascade. When Johannes’ and Julia Meyer went back to New York state they took their youngest son Charles back with them. Johannes’ daughter, Catherine (known as Kate) was still in New York. 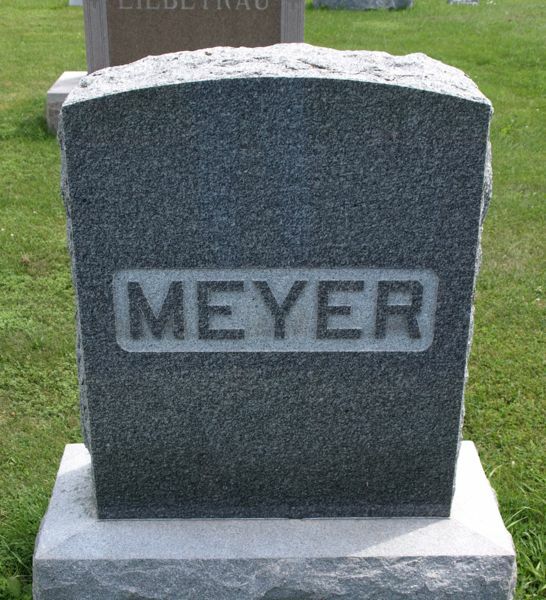 The remaining 5 Meyer children remained in Wisconsin. Margaret married Phillip Welter and eventually ended up on a farm in Kaukauna, WI. Anna had married Fredrick Seyforth ( Julia’s son) and moved to a farm in the area of Pepin, Wisconsin. Mary married Wilhelm Demand, a civil )war veteran. They lived in Sheboygan, WI. The two boys John and George were still unmarried when their father left but also remained in Wisconsin. George married Sophia Allman and eventually moved to Brown county, South Dakota. 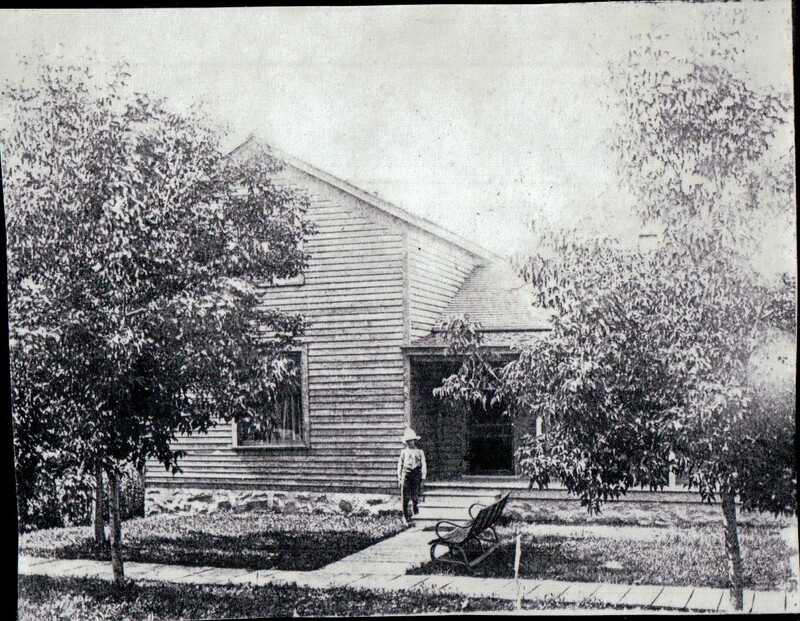 And John, my great grandfather settled in Cascade, Wisconsin where he became a shoemaker. The 1880 census shows him boarding with August Hafenmeister, also a shoemaker and his wife. In the same census a young woman by the name of Maria (Mary) Thomsen is living and working as a servant in the town. The following year these two would marry on July 10th, 1881. Mary was quite a bit younger than John. She had been born in 1860 in Denmark. Thus making her almost 16 years younger than he. They settled into a house in Cascade and soon their first son was born. They named him William. He died about a year later of summer complaint. He was followed by three more sons, Frank born in in 1884, Geroge H. in 1888 and Arno A. in 1893. In 1892 John and August Hafenmeister dissolved their partnership and John continued to run the shoe business until 1925 on his own. 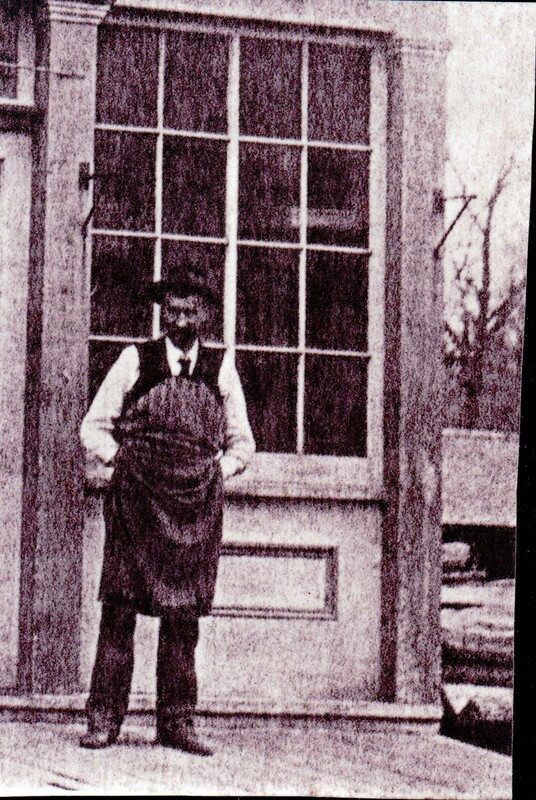 The picture below is a photo taken of John Meyer in front of his shoe shop. I know very little about their life there in Cascade except through frequent mentions in the Sheboygan Press after 1914 until his death in 1926. His shoe shops was reported as a popular meeting place for the villagers to congregate to share the happenings and news of the day so he must have been a friendly, outgoing kind of man. In January 1915 the Shebogan Press reported that John Meyer had remodeled and repainted his store and added electric lighting an improvement the paper suggested others in the village should also do. The frequent postings in the Sheboygan Press similar to the ones below tell us friends and family were an important part of their life. March 11, 1915 reported that; “Mrs. Koch and daughter Marion left for their home in Sheboygan on Monday after spending several weeks with their rleatives Mr. and Mrs. John Meyer.” (Mrs. Koch would have been John’s niece and daughter of his sister Mary Meyer Demand. Although it is only 11 miles between Cascade and Sheboygan the frequency of family members remaining several days on visits suggest getting to and from the two places was time consuming in the late teens). Still other posts tell of John and Mary going to spend time with the same people in their homes. In 1925 their are several posts mentioning that their grandchildren: John, Gertrude, Margaret and Marilyn have spent time visting their grandparents over night indicating that the couple enjoyed having their grandchildren around. On Dec 8th, 1926 the paper reported that Mr. and Mrs. George Meyer and children visited on Sunday at the John Meyer home. Also that Mr. Arno Meyer of Waldo spent Monday at the John Meyer home. These 2 visits were most likely precipitated by a stroke John had suffered at about that time. A week later on Dec 13th he died at the age of 81. His obituary reported he had been in the shoe business for more 60 years and had enjoyed good health up until the stroke that resulted in his death. His funeral was held at the Cascade Lutheran Church and he was buried in St. Paul’s Lutheran cemetery, in Cascade. This entry was posted in Uncategorized and tagged 52 ancestors in 52 weeks, ancestry, Anna Maria Brock, Cascade, Charles Meyer, family history, genealogy, John Meyer, Meyer family, Wisconsin on April 19, 2014 by kwriter13. Imagine, you’re waiting on the crowded dock, pictured above. It’s a day in late Aug or early Sept in the year 1849, the year the Meyer family emigrated to the United States. Now imagine, in addition to yourself,you must also keep track of your spouse, 6 children (ages 1-10) and all your worldly possessions. A mix of exhaustion, excitement and fear run through your mind. Have you made the right decision? Is this move really going to be better for you and your family? Will you and the family even survive trip? Never mind, it’s too late now to turn back. Perhaps Margaret, the eldest child, is holding her, year old brother, George, while her mother tries to keep track of the four others and her father their possessions. They don’t dare lose sight of them now, for any moment they will hear the announcement they can finally go abroad. Are John, Catherine and Anna, the three middle children, getting antsy. They’ve been waiting for days to board the ship and are tired of having to stay so close to their parents. Maybe little Maria, age 3 is crying, in need of a nap and frightened of the throngs of people around them. For the past few years the family watched as others left their beloved Alsace. They’d read the letters of those who’d gone ahead and listened to the various agents who came to their village touting of the riches to be found in America. But it wasn’t until this year, when agents from Lewis County, New York came talking up the county where the farmland was fertile and plenty, they paid much attention. To Johann and Marguerite a place with plenty of land for their own and eventually their children sounded to good to pass up. Life in Alsace has been getting harder and harder with each passing year. Years of frequent wars, harsh winters and epidemics make leaving look better and better. Jobs are scarce and prices keep getting higher and higher, as a growing population struggles to survive. And the prior year brought both war and famine to their area. What will the future bring if they stay? Will their children have any hope for a good future? And so after much discussion and debate Johann and Marguerite made the difficult decision to emigrate. First they had to pay off any debts and taxes they owed and obtain passports confirming their identity. Plus they had to have enough cash to buy their passage, sustain their journey and allow them enough to start over in the U.S. In the last year Johann has set about taking care of his obligations and selling off all of his holdings to enable him to sail for America. Now everything is done, it is time to leave. Because of the cotton trade, departing cotton ships leaving the port of Le Harve, France are always looking for paying passengers. It is their best choice. Plus the route is shorter taking only 20-30 days. The best crossing times are between April to September. But this last spring Le Harve had a cholera epidemic. Mayors of the village were asked to stop issuing them, making it harder to leave. Now in August, they have obtained the necessary documents. If they wait any longer they will have to risk a harder crossing or wait until next spring.They sell off the last of their possessions deemed unnecessary for their voyage. To get to Le Harve they first have to cross France. Like most emigrants from Alsace they probably used empty cotton carts leaving Strasbourg. I can imagine Johann loading the cart with their trunks and boxes while Marguerite added their linens and bedding. In addition to the clothing, tools and utensils they will need once they reach America they are expected to provide their own bedding and provisions on the ship. The time for final good-byes has come. The family stands outside their home and takes one last look. When the wheels of the wagon begin to rock they turn their heads and with heavy hearts they begin the first leg of their journey, the trek across France. Quite likely, when they reach Paris they stop for a day or two to take advantage of what the capital has to offer and perhaps replenish their provisions. Finally they reach the port of Le Harve to wait with thousands of others. Johann still needs to book their passage. A colony of innkeepers and shopkeepers lined the port. 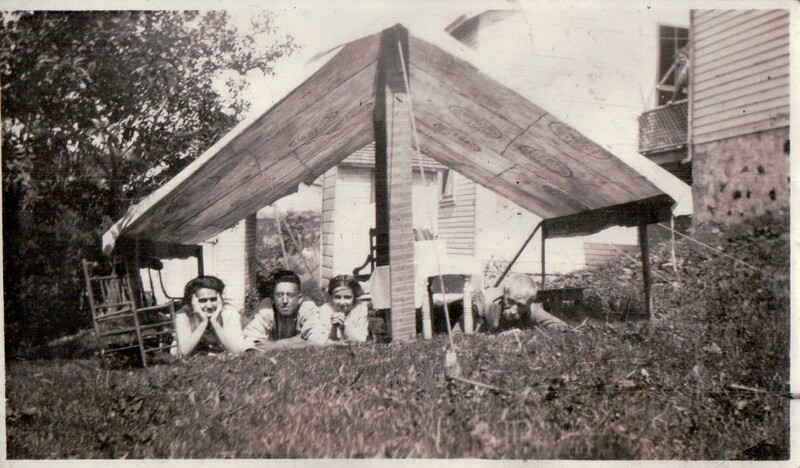 Was the family well enough off to stay in an inn or did they make do camping on the dock in a shack or make shift tent? Sometimes it was necessary to wait weeks before as ship was ready to set sail. 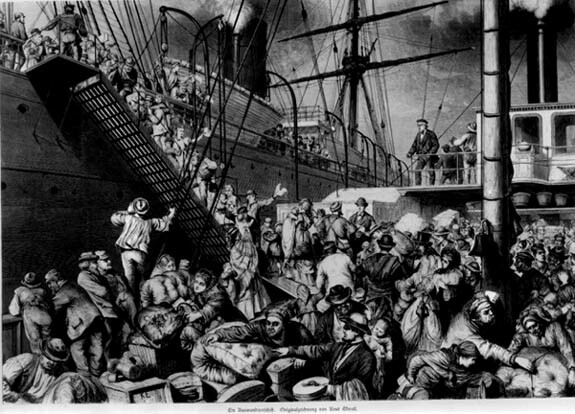 Once on board they would have to camp out in a crowded steerage area. There was no lighting and it also was not dry. Water seeped in through the ventilation holes. Like most passengers they were probably seasick the first few days. If it was stormy it wasn’t possible to go up on deck for fresh air. There was only one toilet per 100 people. Diseases spread easily. They had to cook their own meals in crowded conditions. What an exciting day it must have been, after weeks in the cramped dark steerage quarters of the ship with only endless ocean for scenery, when someone announced they could finally see land on the horizon. What was to come was still unknown for now they were thankful they’d survived the crossing. This entry was posted in Uncategorized and tagged 52 ancestors in 52 weeks, Alcase, ancestry, family history, Johann Meyer, Le Harve France, Lewis county, Meyer, New York, NY on February 18, 2014 by kwriter13. Growing up my family never celebrated old customs or made traditional foods the way many of my friendsdid. We were American, that was good enough. And it was – except I wanted to know more. My paternal grandfather told me his family had come from the south. He thought they might have owned a plantation and had moved North because of slavery. But he had no idea where or when they had originally came here. My mother, on the other hand, knew her grandparents had come to the U.S. as children. She thought they’d come from Prussia to avoid it’s warring ways. Why they’d chosen to live in Wisconsin or if they’d ever lived elsewhere in the U.S she couldn’t say. She’d heard the Meyer’s were somehow connected to the Roosevelt’s of NY and her Dad had two cousins who lived in upper NY by the name of Edith and Pierre. She thought they might be rich as they wintered in Florida. Later she remembered that her grandpa Meyer had come from Alsace Lorraine and his wife from Denmark. And there had a been some kind of remarriage in the family with a his, hers and ours sort of family. She thought it was probably John’s parents and that one of them had returned to live in Europe. Two things she was sure of, her grandfather had been a shoemaker and he and his wife, Mary Thomsen had raised their family in Cascade. While she didn’t know much about her grandparents my mother did know lot more about her Meyer uncles. 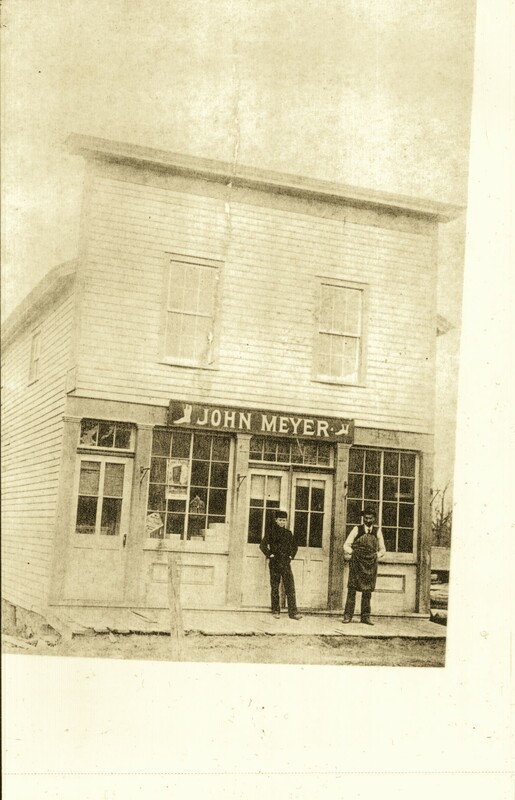 She knew the oldest had been born inn 1883 and a still older son had died as an infant.That meant John Meyer would have had to have married no later than 1880-81. My first search was to see if I could find him in the 1880 census. Today I could pull up the record quickly using my computer but In the 1990’s I had to find both the Wisconsin 1880 census and it’s index in a library. Lucky for me my local branch had both. Scrolling through the microfilm I found a John Meyer,living in Cascade, single, age 35, boarding with a August Hafemeister. Both men were shoemakers and John had been born in France. Since Alsace was part of France, he sounded like my man. Better yet, a few entries down was a Mary Thomsen, age 20, a servant for the hotel keeper. Schleswig, a part of southern Denmark, was listed as her place of birth. Chances were she was soon to marry the shoemaker. I felt sure I had the right people but I needed more proof. Plus, I still wanted to know when had they come to Cascade and who were their parents? Had they come alone as teens or with families? I decided to write to the Sheboygan county genealogy society and see if someone could find their marriage record. While I waited for an answer I shared the information I’d found with my mother. She in turn unearthed a scrapbook her mother had kept. It was a mish mash of stuff, most having nothing to do with the family, but in the very back she had written down the names of the Thomsen side of the family. Now I had Mary’s parents and siblings names and birthdates. No town name was given but she did say they had come from Schleswig a part of Denmark. Meanwhile I went back to the 1880 census for Cascade and found Mary’s parents Thomas and Anna Thomsen. He was a wheelwright. Not long afterwards I received the marriage record in the mail. A John Meyer, son of Johannes Meyer and Marguerite Sontag, had married an Anna Mary Thomsen of Cascade. John’s birthplace was listed as Airshiem, Alsace. Also enclosed was a newspaper clipping from their 25th wedding anniversary and an ad for John’s shoe shop. The 1890 census had been lost in a fire so the next census I could consult was 1900. It would, if I could find them, tell me how long they’d lived in this country. I found John and Mary still in Cascade along with their three sons. John’s arrival was listed as 1848 and Mary, or Anna M. as the census listed her, as coming in 1874. Both had their place of origination shown as Germany but since both Alsace and Schleswig were under German jurisdiction in 1900 it wasn’t unexpected. Neither the 1880 census or the 1900 census had any indication of John’s family living nearby. If he had arrived in 1848 he’d only have been 4 or 5 years old. Where was his family? What had happened to them? And how did the two NY cousins fit in? To learn I was going to have to dig farther back into time. The question was where? This entry was posted in Uncategorized and tagged ancestry, Anna Maria Brock, Cascade, genealogy, Johannes Meyer, John Meyer, Marguirite Sonntag, Pierre Meyer, Sheboygan County, shoemaker, Thomas Thomsen, wheelwright, Wisconsin on January 16, 2014 by kwriter13.